Ethiopia, Zone9: “Terrorist” for being a ‘bachelor’! Aduňa Kesso is a Qeerroo. According to Aduňa, Qeerroo in Afan Oromo means ‘a young; bachelor who who does not have a child yet’. “You can’t help it I’m a Qeerroo”, he jokes comparing the fact that I’m 10 years older than him. He was a 2nd year Electrical Engineering student at Adama University when he was arrested in May 2014. Aduňa was arrested following students’ protest against the introduction of the controversial Addis Ababa’s new master plan. As the new master plan intends to integrate the sprawling capital, Addis Ababa with Oromia, the adjacent Regional State, the Ethiopian government calls it Addis Ababa-Oromia integrated Master Plan. But students particularly from Oromia consider the new master plan as Ethiopia’s central government illegal expansion into Oromia Regional State at the expense of local farmers. By then, I along with six of my colleagues from Zone9 and the three journalists were also in jail. During the heyday of university students protest. We were detained in Maekelawi, the country’s notorious pre-trial detention center and I have no idea of what was going on in the country. Maekelawi is not only a detention center but it also is a seclusion center. Twenty or so days into my 544 days of incarceration, we were joined by students from Oromia who were arrested due to their protest of the new master plan. In Maekelawi our cells were located in its infamous part,inmates call those cells ‘Siberia’ because of their unbearable cold. The new inmates were added to our tiny cells. Total of 15 students were arrested (11 of them were released from Maekelawi in political intervention from the Oromia state; 6students including two other students who were later detained and were charged of detonating a bomb at Haromaya University.Among them was Aduňa who became one of my inmates. Aduňa is from Salaale,a rural part of Oromia. He is not only the first of his family members to have joined a university but also to a bit of have an exposure to urban life. 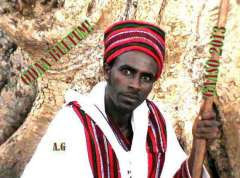 In Adama University, he said, he learned about the ethnic issues of the country.He speaks little Amharic, the official working language of Ethiopia’s federal government. His interaction with non Afan Oromo speakers was limited and most of his friends were Afan Oromo speakers. He later had joined and became active member of the Oromo Students Association. It was in this process that Aduňa came to be interested in political activism. He joined Qeerroo Bilisumma Oromia (‘The Oromo National Youth Movement for Freedom and Democracy’), a lose network of Oromo youths for freedom and democracy. This has introduced him with other members of the network in different universities of Ethiopia. As a part of his political activism, Aduňa has also joined social media - specifically Facebook.He has written his comments on wide range of issues. He spread news. I guess this might have instigated Ethiopia’s government Intelligence Office to tap his phone. Initially, Aduňa did not know that his phone was tapped; he learned about this when the prosecutor attached the paraphrased transcripts of his phone conversations as evidence to support government’s terrorism charges. The charges pressed against him were being a member of OLF an irrelevant political organization which is labeled as ‘terrorist group by the parliament of Ethiopian government. He was also charged in conspiring to detonate the bomb at Haromaya University, which caused a death of one student and 70 casualties. When Aduňa was brought to Maekelawi his healing wounds on his arms and legs were visible. He told me that his wounds are from the tortures he received in anonymous locations. He had a punch blot on his face, under his left eye. But, he looked OK.To my surprise he jokes and laughs. For me, that was the time I was trying hard to get used to the first days of my rough experience. My first laugh came after his jokes; a laugh that made me feel I owe him the exact kind of laugh that you need when you think you won’t laugh again. Before they moved him to Maekelwi, Aduňa spend 19 days in a place where he didn’t know because he was blindfolded when they arrested him and brought him to Maekelawi. He was beaten badly. His wounds on his legs are from kneel walks. He told me he was forced to kneel-walk on a concrete floor while being interrogated. Once, he told me, the interrogator was speaking on the phone with a woman while interrogating him. Aduňa had noticed the woman was making his interrogator laugh.This was, by experience, a good sign for Aduňa. “When he smiles,” Aduňa said,“The punishment usually eases”. So, he took advantage of this and stopped kneel walking while the interrogator was talking to the woman. Its consequence could be dangerous but Aduňa had to take a risk to get some relief from the pain of the interrogation hoping that the woman, at the other end of the phone, would make him laugh even more. Once the interrogator ended his phone conversation with the woman and asked him, “Why did you stopped kneel walking?” Aduňa answered, “Ayi… Antaeskiticheris biyé naw” (No….I am just waiting until you to finish your phone call). Luck was with him, the interrogator laughed it off and allowed himto be interrogated while sitting. This is a brutal lived experience for Aduňa;but, he narrated it without any sense of resentment. His positive interpretation of things coupled with his limited but humorous Amharic was our source of vitality in Maekelawi. For Aduňa, ‘Siberia’ is like a haven when he compared it to the anonymous place where he was held immediately after his arrest. He used to say that “he had felt released when he was brought to Maekelawi. A couple of days before his arrest, Aduňa received a call from his friend who was a student at Haromaya University. On the phone, Aduňa’s friend told him that an undefined people detonated a bomb while students were gathered to watch a soccer game in campus.Shocked with this irresponsible act of violence Aduňa reacted angrily on his phone “how could one do such a thing?” During his trial, Aduňa learnt that this part of his phone conversation was transcribed, paraphrased and used out of context as evidence to support government’s allegation of his terrorist activities. Infact Aduňa condemned the action and expressed sympathy for the victims;however, the police used it against him. Police claimed a connection only because his Qeerroo friends informed him about the tragic incident. However, for Ethiopian government giving a constructive feedback on their policies is counted a crime. Aduňa and his friends were just giving aconstructive feedback that the new master plan must not be implemented but, the government used the isolated tragic incident as an opportunity to destabilize their dissents. It is interesting to reveal the situations going on oromo people in Ethiopian prison houses by Ethiopian government. The blog's acceptability will increase if you write fairly like you are doing now. It is a great story, and appreciated your effort to uncover the story of Oromo student in prison. Keep uncovering the stories of other Oromo political prisoners in jail, and there are lots of such innocent students and farmers who are victims of barbaric and inhuman acts of the Federal police in Ethiopia. You blog because you care! You are showing it. Thank you! Addunyaa Keessoo was not a second year student , rather he was a 4th year mechanical engineering student at Adama science and technology University(ASTU). I hope you will come up with news about their current situation, what the so called the Federal High Court has decided. I hope that doing this will help every one in the country or abroad to realize the absence of justice in the country.